ISLAMABAD, July 11 (APP):Minister for National Health Services, Regulations and Coordination, Muhammad Yusuf Shaikh Wednesday reiterated the government’s commitment to work in unison to increase people’s awareness about population issues with focus on family planning, gender equality, poverty, maternal health, and human rights. Addressing a seminar on the occasion of World Population Day 2018, the minister appreciated the efforts of the provincial governments and reaffirmed that the federal government would fulfill its international commitments. While expressing serious concern over the rapid population growth in Pakistan, he stressed that the country could not reap up the benefits of population dividend and capitalize upon the youth bulge without an extraordinary action. He indicated that the Pakistan Commission on Population was being reactivated with revised composition and Terms of Reference as contained in the National Population Policy 2017. He said that the Federal Government was in the process of setting up a special fund for population Initiatives with an allocation of Rs 5 billion. He recommended that a dialogue be initiated on developing national consensus on freezing the population factor on the basis of Census 2017, in the National Finance Commission (NFC) Award and in determining political constituencies, in the provincial and federal governments. Pakistan is the fifth most populous country in the world with 208 million people and a population growth rate of 2.4% per year. The rising population numbers are likely to outstrip developmental gains, and continue to adversely affect the economy, environment, health, education and quality of the lives of all citizens. The theme for this year’s World Population Day ‘Family Planning as a Human Right’ is apt for Pakistan at this crucial moment in time. The theme is in line with the 50th anniversary of the 1968 International Conference on Human Rights, where family planning was, for the first time, globally affirmed to be a human right. This right-based approach strives to empower every couple to their entitlement to decide on the size of their family, ensuring that every pregnancy is wanted. Federal Secretary Ministry of National Health Services, Regulations, and Coordination, Capt. (Retd.) Zahid Saeed said that Pakistan’s population was growing at an alarming rate of 2.4% per annum. He said that population was a cross-cutting issue. It has its implications on all spheres of life and stressed that all implementing partners and stakeholders would have to make concerted efforts for population stabilization in Pakistan. The Provincial Ministers of the Governments of Punjab, Sindh, and Khyber Pakhtunkhwa, and the Secretary Balochistan reflected the resolve of their respective governments to implement family planning programmes in their provinces through a right-based approach. 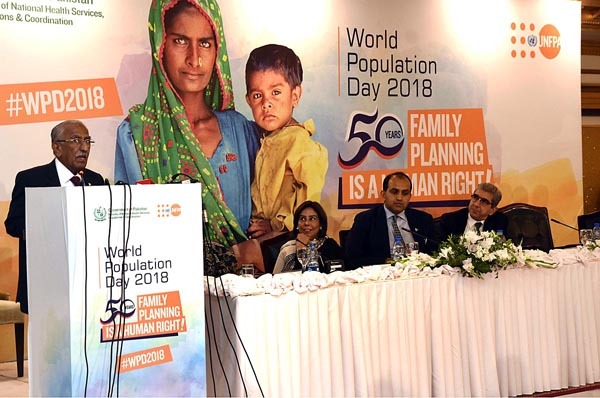 UNFPA Representative in Pakistan, Dr Hassan Mohtasami delivered the message of the UNFPA Executive Director Dr Natalia Kanem who said that UNFPA was fully committed to continuing to support countries’ efforts to uphold the right of individuals, especially women, to plan a family. Other speakers spoke at the occasion included, Former Federal Minister for Health, Dr Saniya Nisthar, High Commissioner of Australia, Margaret Adamson and Deputy Director of DFID-Pakistan Ms. Kemi Williams. A pledge was signed by the invitees that reaffirmed the collective efforts of the government of Pakistan, and its stakeholders, towards the FP2020 commitment of ensuring all citizens the entitled high quality family planning information and services.